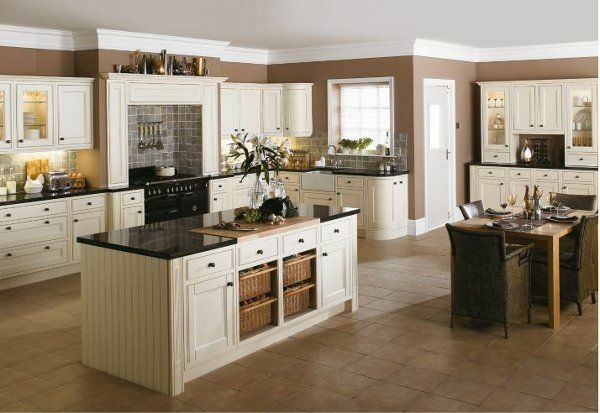 The country kitchen style has its own charm and elegance. While there can be several ideas for designing your kitchen in this style, it should always exuberate comfort and warmth. A country kitchen has several design elements that include the use of metals, wood, and textiles. Check out here some essentials that can be varied to give a personalized cozy touch to your country kitchen. 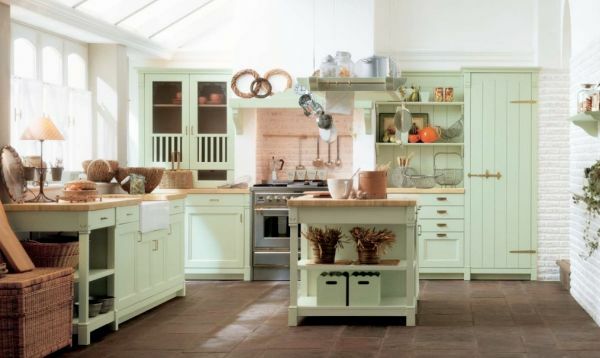 A country kitchen looks appealing only when you use soft and light colors. You may go for creamy whites, coffee browns, pale blues or greens, or beiges. Choose wood finishes while making selections for shutters or cabinets. Pick up a complementary color palette rather than contrasts. This gives you a good blend of colors for a soothing effect. While buying a dining table, chairs or even shelves, choose wood or wrought iron as your materials. These go perfect with the décor of a country kitchen. You may also select such stuff in other traditional metals. You can match it all up with hardwood or weathered brick flooring. Some wooden cutlery may also be used. Decorate your country-style kitchen with patterned fabric that is light to feel. Go for frilled doilies, napkins, chair slipcovers, and tablecloths. These could also be embroidered or the ones with floral designs. Make use of similar patterned fabric for kitchen window curtains. You can also try to display some beautiful pieces of crockery and glasses. While these can be decorated in a formal manner on the dining table, you can also display them in glass-fronted cabinets and shelves. This adds up to the visual appeal of your country-style kitchen. 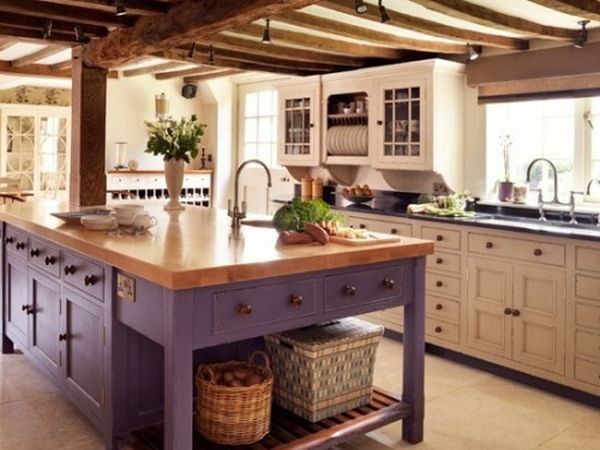 A country kitchen is never complete without a kitchen island. If you do not have a large space, then you may use a vintage table as a replacement. Additionally, you can go for a deep farmhouse sink, old-fashioned kitchen faucets, and white porcelain tap handles. Choose some nice vintage doorknobs to complete the look. Do not forget to find some pretty flower vases and add bright yellow, red, orange, or blue flowers to them. The décor of your country-style kitchen will be complete with these flowers. Finally, ensure that your kitchen receives sufficient daylight and has traditional-style lamps to light it up. 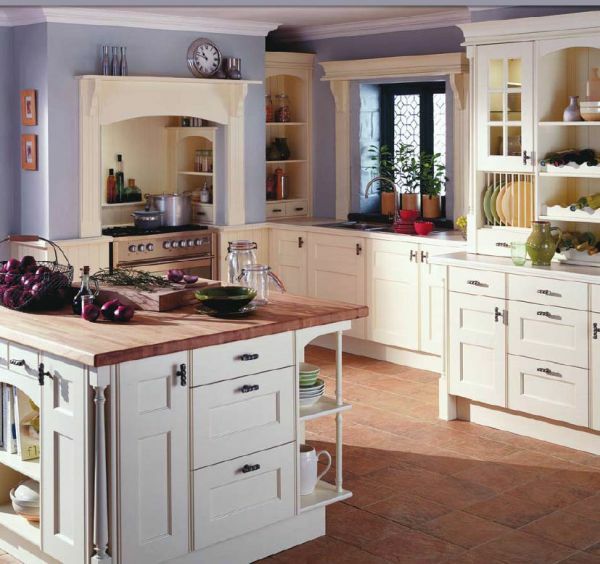 From flowery fabrics and wooden furniture to rusty accessories and light natural colors, it is important to focus on each of these design elements in detail if you want to own a beautiful country-style kitchen.